Sign-up for the Chamber’s e-Update and stay up-to-date on local business news. The Chamber e-Update is a weekly email service published every Monday, created to keep the business community informed about chamber events, news, trends, and services available. In addition, all members are invited to submit text for events, free of charge, in the Member Events section. Simply email a short 1 paragraph description to Emma Stratton. (The Chamber reserves the right to edit all submissions). The e-Update service is free and CAN-SPAM Act compliant. Every email generated contains an unsubscribe link which allows members to opt-out of future emails. Members who opt-out are automatically updated on our subscriber list to avoid the chance of sending unwanted Chamber e-Updates to them in the future. In addition, the Chamber e-Update subscriber list is not sold or distributed. With 4,200+ subscribers, the e-Update is a great way to advertise and reach key business leaders and decision-makers about your firm’s products and services. 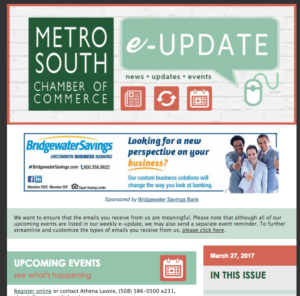 Our trackable statistics show above-average results with over 40% of subscribers reading the Chamber e-Update each week. When you advertise, your ad will be linked directly to your website. Side column ads and featured ads are available. Click here to download the e-Update advertising agreement. Anyone may sign up to receive the e-Update, however event submissions and advertising is open to members only.